However, under the Western influence, now a specific day in a year is fixed as ‘Father’s Day’ ‘Mother’s Day’ and ‘Teacher’s Day’ for showing respect to them, and even that is not observed by all. The parents, who bring up their children with the best possible care and affection, look forward to reciprocal treatment from their children, especially sons, during their old age. However, the newspapers intermittently report cases in which the children neglect their aged parents, some of whom seek judicial intervention for relief, while those who can afford opt to live in old Age Homes. Astrology is a helpful guide for knowing before hand whether one is destined for helpful children or not, and in the light of that plan for satisfactory old age. In a horoscope, the Lagna shows the individual himself, the 2nd house relates to family, the 7th house to spouse and the 5th house primarily to progeny. Jupiter is Karka for progeny, and especially son. The Sun, Jupiter and Mars are male planets and facilitate the birth of son. Saturn, Ketu, Rahu and other functional malefic cause delay, denial or unhappy relations and lack of happiness from children. If the 5th lord is in 5th itself and expected by benefices, one gets happiness from children. Strong benefic 5th lord indicates helpful progeny. If the 5th lord is in 7th house, then children have good character and are dependable. If the 5th lord is in 9th, 10th or 11th house, the native is proud of his children. If Jupiter, with 5th lord and Lagna lord, is posited in Kendra or Trikona, then it indicates happiness from son. If in a native’s horoscope the Langa and 5th lord are mutual friends (for example, Jupiter and Mars) and conjoin, aspect each other, or are located in each other’s sign, then the son will look after the individual. If unaffiliated Sun is in 5th, or 9th house, then the son will be obedient to the native. If the lord of 9th house (5th from 5th) is in 7th house (11th to 9th house) and aspected by Jupiter, then the son will be obedient. If the 3rd lord is in 5th house or 5th lord is in 3rd house, the son will look after the parents, and also have cordial relations with other relatives. The native has two sons who are very well placed in life. The 5th lord Jupiter is in 10th Kendra forming Gajkesari Yoga with 9th lord moon and is also aspected by exalted lagna lord. Both the sons are looking after aged parents and providing all possible comforts to them. The Lagna lord Mercury and 5th lord Saturn are in Kendra and aspected by Jupiter. The native is belling looked after very well by his two song. The lagna lord and 5th lord are friend and conformal is Kendra. If the lord of the 5th house, even when benefic, be debilitated or eclipsed, or in inimical sign, the native will not get happiness from children. If the native’s lagna lord and 5th lord are natural enemies (like the Sun and Saturn), then there will be enmity between father and son. If the two are neutral, then the relationship will be so. In Indian mythology Saturn is son of the Sun, but both are inimical to each other. Whenever the Sun and Saturn in a horoscope are conjoined, aspect each other, or shashtashtaka (6/8) to each other, the relationship between the father and son is far from cordial. If the lord of the 5th house is located in 6/8/12 house and aspected by the lord of lagna as well as Mars or Rahu, the son is always opposed to father. If the lord of 12th house is in 5th house, then the son will be extravagant and source of worry to the native. If the 12th lord is weak and afflicted in the 5th house, then the child will remain sick and cause worry to, and expenditure by, the native. If the lagna lord and the 5th lord are shashtashtaka (6/8 to each other), then one should not expect happiness from children. The dwi-dwadas (2/12) location of the lord of lagna and the 5th lord shows little happiness from children. A weak or afflicted Saturn alone in 5th house or 9th house spoils parent-child relationship. 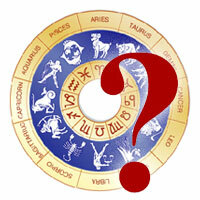 If Mars, Saturn or afflicted Mercury is in 5th house, then the child will oppose the parents. If the planet in 6th is aspected by Rahu, it increases such possibility. If Mars and Rahu are with Jupiter in the 5th house, then the son is disobedient. 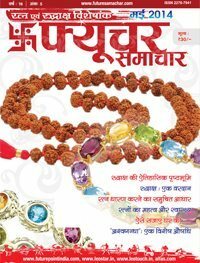 If Jupiter or lord of 5th is in 6th or 8th house, then one should not expect happiness from children. If the Sun is posited in 5th house in the sign of Saturn (Capricorn or Aquarius), and receives the aspect or Mars, the children will be miserable. If Moon is in the 5th house in Mars (Aries or Scorpio) Rasi or Navamsa, and aspected by Saturn, the children will be foolish and mean. The native had a very unhappy married life due to his domineering nature, which cast its effect on the psyche of his only son, who on getting employment took away his mother with him. The 5th lord Jupiter, and also karka for son, is combust in 4th house and aspected by Rahu from 8th house. The native led a lonely retired life and died after prolonged illness. The 5th lord Saturn is posited in 9th house in friendly sign, but is aspected by the Sun and Mars. The opposition of the Sun to 5th lord Saturn, and also aspect of Mars on Saturn caused differences with his only son, who is living separately with his family, and the native is leading a lonely retired life. 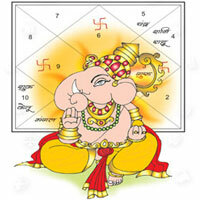 The 9th house in a child’s horoscope denotes fathers, luck religion, etc. If the lagna lord and the 9th lord are in harmonious location to each othe, it indicates cordial relationship between the child and father. Some planetary combinations in this regard are as follows. 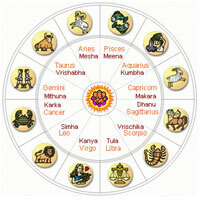 When Lagna of son corresponds to the 3rd house of father’s horoscope, then the son will be dutiful to father. When the Sun is in its highest exaltation (Aries-100) and the 9th lord is in 1th house in child’s horoscope, he will be devoted to his father and of religious bent of mind. When the Sun is in a trine from the Ascendant, the 9th lord is in 7th house in conjunction with or aspected by Jupiter, the native will have great devotion to his father. If the 9th lord in son’s horoscope is in 10th house, and the 10th lord is posited in 2nd house, the son will be proud of father. The child will have friendly terms with his mother if the lord of lagna and 4th house (mother) are mutual friends, and are conjoined with or aspected by benefic plants. When the 5th lord is in 9th, in conjunction with or aspected by the 9th, in conjunction with or aspected by the 9th lord, and Jupiter be in 5th house, the father prospers due to son. If Rahu is son’s horoscope is in 9th house without any benefic aspect or association, the relationship with father will not be cordial. If the 9th and 6th lords are in each other’s house, then the father and son have inimical relationship. When the lagna of son corresponds to the 6th or 8th house of father’s horoscope, then the father and son have inimical relationship. When Lagna Lord in son’s horoscope is in 8th house, and the 6th lord is in 9th house, the native will be contemptible and there will be enmity between him and his father. If the lord of 9th house in son’s horoscope is in debility and in conjunction with Rahu, then the native will hate his father and perform bad deeds. The native is the only son of his parents. Moon is afflicted by Rahu and has Kendra effect of Saturn, which has made him a very suspicious young man. The 9th and 6th lord Mercury is conjoined with 8th lord Sun and exalted Mars in Lagna, and aspected by Saturn from 7th house. the native always finds fault with his parents and even abuses them. This is the horoscope of the son of individual whose horoscope is discussed at Sl.3 above. He is an engineer by profession and well settled in Mumbai. Due to the opposition of Saturn in own sign in 9th house and the Sun in 3rd house, the father and son did not have harmonious relations and the father passed his old age alone.